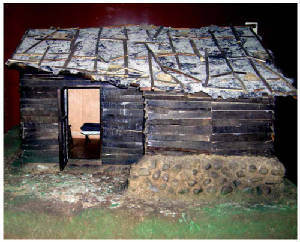 A miniature representation of the poorhouse on exhibit in the Father Al’s Museum. Father Al moved into his “Poorhouse” in 1961 to give the Benedictine Sisters a place to stay in the parish rectory. Fr. Al stayed in his poorhouse until 1965, when he left the Parish of Song-do in Busan and moved to another location, where he set up the headquarters of the “Mariahwe” Sisters and his Child Welfare Program. Here is Father Al’s first hand account of his years in his poorhouse. You may ask what helped me relate to the poor. As I mentioned previously, I was named pastor of Song-do Parish in Pusan. In the spring of that year, I moved out of the Bishop’s house where I was staying to take up my duties as a parish priest. At first I lived in a small Korean cottage, which was part of the parish plant. After considerable effort and using the good offices of Bishop Choi, I prevailed upon some Korean Benedictine Sisters to come live and work in the parish. Korean Sisters are a great asset to any parish in Korea. They conduct catechetical classes, work with the children, do home visitations, help with the liturgy, and assist the Pastor in many other ways. Their presence heightens the spiritual tone of the parish and very often means the difference between a parish which is alive and dynamic and one which is dying. I was delighted that three Sisters were coming, but there was one problem. There was no place for them to live. I could have built a convent on a small piece of ground adjacent to the Church, but this would take time. Since the demand for Sisters at that time was very great and the supply was very short, I felt that any delay in establishing the presence of the Sisters in the parish might result in losing them. At that time there was a Korean squatter family living in a shack which they had built on church property. The shack was a non-descriptive hovel with a tarpaper roof and mud walls, similar to what other people in the parish were living in. I offered this squatter family a sum of money to purchase or rent shelter elsewhere, and prevailed upon them to move out. My idea was to fix up the shanty in which they were living and use it as a temporary rectory. After the premises were vacated, I went to inspect my future dwelling with my parish assistant, Damiano. The place looked very uninviting and I wasn’t sure whether it was livable or not. I turned to Damiano and asked what he thought. His reply was simply, “Sure, Father, with determination you can do it.” That simple remark was decisive and I decided, under the circumstances, to give it a try. When people in the parish got wind of what I was going to do, they reacted with horror. The fact that the shack differed very little from the houses in which many of them were dwelling seemed to make no difference. They uttered dire predictions, which had a somewhat unsettling effect on me. They predicted that if I didn’t die of tuberculosis, I would be eaten alive by the rats and bugs, and if sickness and rodents didn’t do me in, then robbers, who would assault the place at night and smash my head, would finish the job. Frankly, what worried me more than the tuberculosis, rats and armed robbers was the simple fear of making a fool of myself. But the words of my faithful servant, Damiano, “With determination, you can do it” urged me on. Of course, what I might term “determination” another would call “bullheadedness,” but that’s another matter. I fixed up the shack as best I could and move in. It worked, but just barely. I encountered a number of difficulties. First was the smell, a rich, earthy, overpowering smell, composed of human excrement, dead animals, garbage, bugs and dirt. At first, the smell was so awful I had trouble sleeping at night. But I kept shifting my sleeping bag about the house until I eventually found a corner where the air was somewhat breathable. Then I made a determined assault to extricate the cause of the odor. I discovered one or two dead rodents in the walls, and using some chemicals eventually changed the odorous aspect of the parish house. Also, I am sure that unconsciously my sensitive American nose became desensitized with time, and although the smell lingered on, my reaction to it diminished. The smell from the dead rats was one problem. The noise at night from the live rats which scurried about in the space between the roof and the ceiling was another problem. Rats are real swingers, and every night when I lay down to sleep, they would come alive and start a disco dance just over my head. Before crawling into my bed at night, I would position a broom alongside me. Another problem was the cold. During winter months cold, icy wind would find its way through many cracks, holes and crevices and at times, heating the place properly became something of a problem. The shack was heated by yonthen coal, as are most homes in Korea. Yonthen coal briquettes are made of compressed coal dust and clay. They heat the floor from below and this works pretty good except they give off a deadly, odorless carbon monoxide gas which every year claims many lives in Korea. While living in my “poorhouse,” on two or three occasions when the floor cracked, or at night when the air was laden and heavy and prevented the smoke from exiting property, the cottage became filled with yonthen fumes. Several times, I remember stumbling out the front door semi-conscious and reeling as a drunkard leaving a tavern at night. After awhile, I considered the yonthen too dangerous and eventually installed a small diesel-burning space heater. One night I woke up to find my shack on fire as a result of the diesel fuel leaking, but the fire was quickly put out and there was very little damage. A final problem, which is in a category by itself, was the problem of the outhouse. The outhouse was located about 20 feet from the front door. I grew rather fond of it over the years. It was a little smaller than a telephone booth and consisted of a leaky roof, four walls made out of planks, and, of course, the strategic hole in the middle of a shaky wooden floor. I have a clear recollection of days when a trip to the outhouse required uncommon courage. It was the rainy season, the wind was blowing, the rain was coming down in sheets, it was cold. An umbrella was useless because of the strong wind, so I would simply fling open the front door, dash 25 feet across the muddy yard, shoot into the outhouse, and position myself. So far, so good. Then as the rain was leaking on my head and I was wondering whether the planks would resist the wind, I glanced down at the spot where a roll of toilet paper should have been. It was gone. The mysterious “toilet-paper-snatcher” had struck again. This was the final blow. I could take the rats and the cold and the deadly gas, but this was something else. It happened repeatedly, and the culprit would leave nary a clue. My toilet paper was not such a luxury, but simply something sold on the Korean market for about 10 cents or so. I didn’t like the dirty, inky Korean newspaper which most people in Korea used, so I indulged in genuine toilet paper. But someone, I never found out who, always slipped into my outhouse and absconded with it. Such were the perils of trying to live with the poor life in Korea. But poor style living had its positive elements as well. One’s surroundings definitely conditions one’s thinking. By living more or less poor, I discovered it was easier to think poor, to feel poor, and to stay on the same wave length as the poor. I lived in this parish shack for nearly five years from 1961 to 1965, when I left the parish with the Sisters and the children to move to another location where I set up the headquarters for both the Mariahwe Sisters and our child welfare program. While living in the shack I wrote my first book, The Starved and the Silent, concerning the poor in Korea and the poverty of Christ. Also, I founded the Sisters of Mary and started my social apostolate to the poor. This shack living certainly was not essential to these programs, but I feel it was quite helpful. My shack also served as something of a protection. More and more funds were coming into Korean Relief in Washington. Word was getting around that I had control of large sums of money for welfare work. Many people began calling on me with various schemes and projects, all requiring capital. Some of these people were bishops and priests and religious. Many of the schemes were half-baked, others were outright phony. Anyhow, I discovered that the office, in my shack, was the perfect place to discuss, and more frequently than not, turn down useless requests for relief funds. Many of the people requesting funds lost their initial enthusiasm when they saw my simple living quarters. Also, my little shack protected my own reputation. At that time there was a great deal of hanky-panky in relief goods and relief funds in Korea. After awhile no one trusted anyone who had at his disposal considerable amounts of relief goods or relief funds in Korea. Since the funds at my disposal were gaining in importance, I automatically would be subject to suspicion and possible accusation of misuse and skimming for my own benefit. But when people saw my living style, any suspicion automatically dissolved. Also, many of the Christians in my parish were “kujae pum Christians,” or “relief goods Christians.” Many of them entered the Church to get free grants of cornmeal, flour, milk powder and used clothing. Many of them still approach the church with a bad “gimmie” complex. So when they discovered that their pastor had control of large relief funds, many of them considered that they had a God-given right to a share. But because of my lifestyle I was in a strong position to refuse useless requests, and I began a campaign of spiritual brainwashing. If I were living in more luxurious surroundings, it would have been very difficult to do this as effectively. Some priest called my house “the monkey cage.” I have no intention of giving a lesson to anybody and I was somewhat embarrassed by these questions. However, I thought the positive aspects outweighed the negative ones, and so I opted to continue. I moved out in 1965. All in all, I consider my years in the “poorhouse” as one of light and grace. And I look back upon this period of time with gratitude and nostalgia.